The Energy Saving Scheme rebates apply to failed fluoro Emergency light fittings. 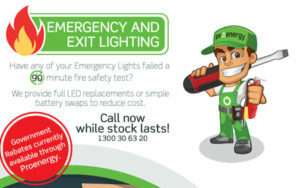 If you get a Fire survey report with FAILED TEST fluorescent Emergency fittings – Battens, Oysters or Exit signs, then use the ESS rebate to help offset the cost of the repairs. Typically, our cost is about 35-50% less than the fire company quote for a strata or commercial property. Just give us a go – get in touch and we will do a FREE lighting audit to include the FAILED Emergency lights. Contact us by filling in this form. Indicate if you are interested in undertaking an LED Lighting up-grade project and we will arrange a free site survey and costing . You can also fill in the form to leave your comments or feedback.